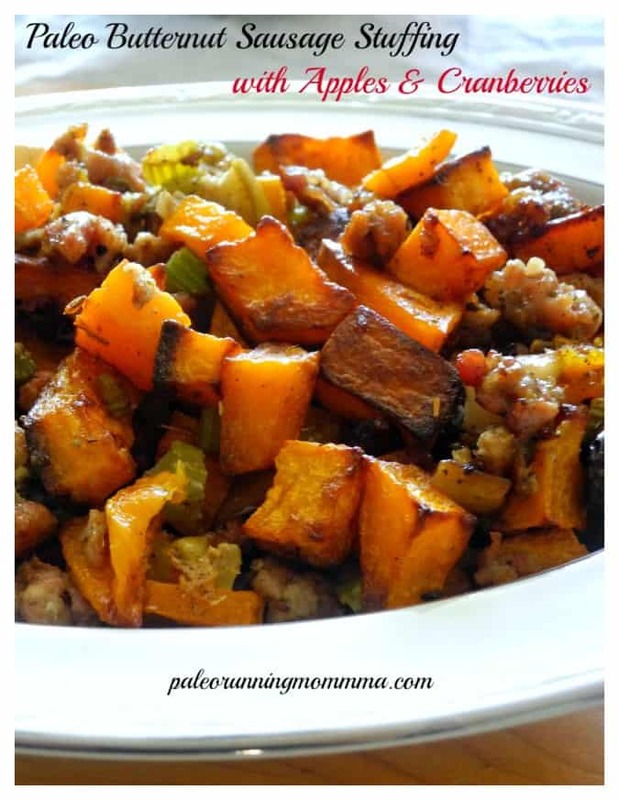 This delicious Paleo Butternut Sausage Stuffing with apples and cranberries has all the flavor of traditional Thanksgiving stuffing or dressing but is grain free, gluten free, dairy free and Whole30 friendly too! 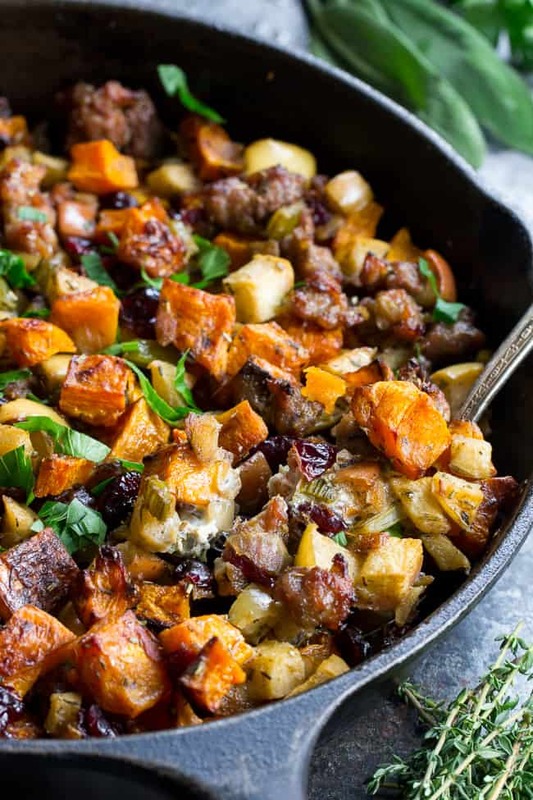 Toasty, sweet roasted butternut squash and savory sausage form the base for this Paleo style holiday favorite. Guys, I’m not the bragging type but I have done something really good here. REALLY FREAKING GOOD HERE. Sorry not sorry about the yelling – but this is GOOD, and, you must try it ASAP. Thanksgiving is my favorite holiday. I have nothing but great memories of cooking and eating classic, comforting, delicious food and laughing for hours on end with my family. What do we laugh about? Everything and nothing all at once – like all families should during the holidays, don’t you think? There are some things, however, that we do take pretty seriously on Thanksgiving. I think we might all agree that even above the desserts and the turkey, it’s the stuffing that has our committed attention on this holiday. I can’t totally explain it, but something about bread cubes with lots of butter and poultry seasoning captures our emotions more than all the other stuff combined. As a result, we can all be a little intense and particular about this side dish fulfilling our wildest of expectations. A lot is invested in it. So, naturally this was on my mind this year, since I don’t eat bread anymore at all. And even though my mom happily subsists on tuna-bagel sandwiches and protein bars year round, she prioritizes stuffing, when it counts. Which is on Thanksgiving in case you’re just tuning in right now. You could tell she was maybe just a little nervous when she asked me “what about the stuffing this year?” as we were chatting about holiday plans. Well, good question mom, THIS is what will be happening with the stuffing. And, even though it might be better than any bread stuffing I’ve ever had, like, ever, I won’t be offended if you still insist on making 3 bags of Pepperidge Farm. Because we’re family and we support each other’s quirks. 2017 Update – but if you’ve tried my pumpkin bread stuffing too and still want the just-add-water variety, we might have problems. 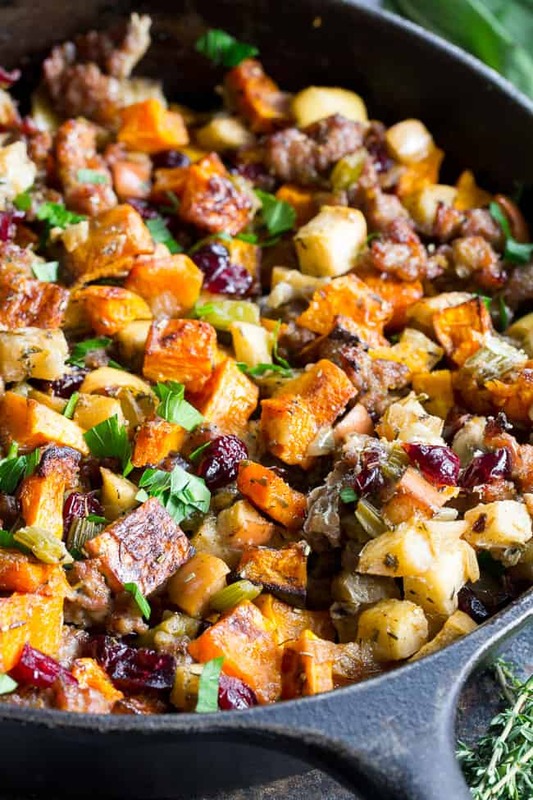 I usually make two different stuffing recipes every Thanksgiving – one to stuff the turkey with and one that is actually a “dressing” (as this recipe is written) to bake alongside the turkey in the oven. I haven’t stuffed a turkey with this one yet, mainly because it’s just so delicious as-is, however, if you wind up trying it – let me know how it is! 2017 update – I’ve been making this stuffing for 3 years now (and not just on Thanksgiving!) and it’s still possible my favorite of all recipes that I’ve ever made – yes – that’s saying a lot! As a bonus, it was also kid and husband friendly, and, honestly, unless someone doesn’t eat meat at all I can’t see them rejecting this. Plus, my kids don’t even normally like butternut squash, but there was just something about the way it blends with everything else that makes it truly addicting in this recipe! Since I’m hoping to experiment with more paleo versions of the classics, you can expect a few more holiday themed recipes in the weeks to come. This is the BEST time of year to cook! 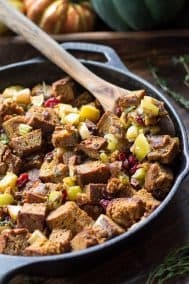 This delicious Paleo Butternut Sausage Stuffing with apples and cranberries has all the flavor of traditional Thanksgiving stuffing or dressing but is grain free, gluten free, dairy free and Whole30 friendly! 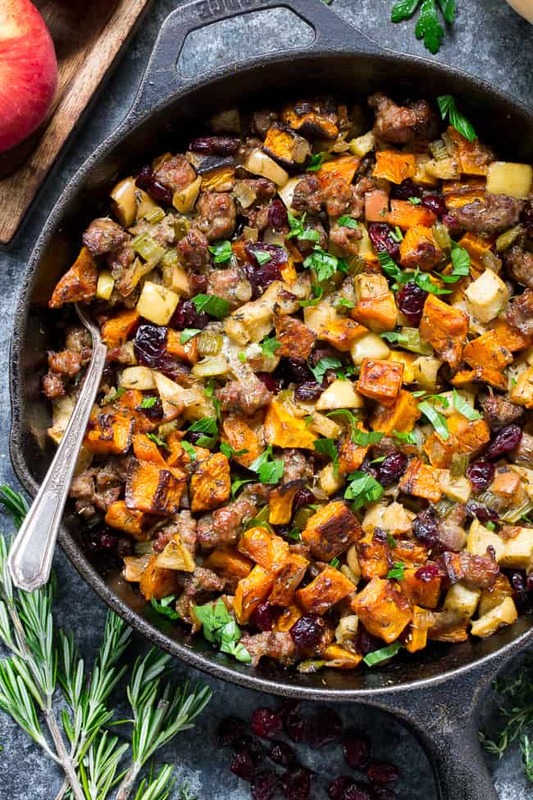 Toasty, sweet roasted butternut squash and savory sausage form the base for this Paleo style holiday favorite. Preheat the oven to 425 degrees. Toss the cubes with the 1 1/2 Tbsp preferred cooking fat and 1/4 tsp salt, and spread out in a single layer on a large baking sheet lined with parchment paper. Heat a large skillet (cast iron/ovenproof is ideal) over med to med-hi heat and add the 2 Tbsp cooking fat. Once heated, add chopped onion and celery and cook for about 3-5 minutes, until softened. Add the chopped apples and cook for a couple of minutes until just softened. Now add the salt and poultry seasoning. Lower the heat and stir to combine all flavors. Simmer for 2 more minutes, remove from heat and set aside. Lower the oven heat to 375 degrees. If you used an ovenproof skillet, you can bake right in the skillet. If your skillet is not ovenproof, transfer the entire mixture to a 2-3 qt baking dish and spread out evenly. Bake in the preheated oven for 30 minutes (less, if omitting egg) or until toasty and set. Garnish with fresh parsley if desired. Enjoy!! **Adding the egg will make the stuffing stick together as it sets in the oven. It's an optional step depending on your preference. Want More Paleo Holiday Recipes? Try One of these! What is your family’s favorite holiday dish? Do you have a trademark holiday recipe that you can’t do without? Squash is a perfect addition to an all time classic favorite. yum! This sounds amazing! And I am really excited for more Thanksgiving recipes! I love anything with butternut squash lately. I am sure this is terrific! Thanksgiving is my favorite holiday too and it works just fine as a vegetarian because I live for side dishes! The side dishes definitely make the holiday! This sounds AMAZING! Holy yum! I love anything with butternut squash! What a great combination of flavors! Bring it to my thanksgiving please? This is my first thanksgiving I am in charge of cooking, eeeek! You’ll do great! Thanksgiving is the best holiday to cook for! Ooh I’d love to try your recipe! you know i will be trying this! loooove the combo and squash! Hope you try, seriously delicious! Yeah, I can’t say that I would be missing the bread with this! Sounds amazing! You wouldn’t even think about it! 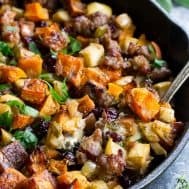 I make a very similar dish except I mix pumpkin cubes and butternut squash cubes and use purple carrots for a varying color as well as celery, chives and a homemade apple sausage very similar. To change it up, I made it the other day with a very light curry, turmeric, cinn, sunbutter light stock. My family loved it. Just a modern bent on an old favorite. Paleo is so much fun because it is so easy to be creative. Made an awesome pumpkin pudding the other day also. Not a sweet desert one, but one to accompany dinner. It was delicious with bits of bacon in it. Sounds great! So many delicious variations on this! Looks good! I love stuffing! By far my favorite T day item. The side dishes are the best. Can’t wait to experiment with more! The best! And the most fun to cook for! this looks amazing! i love any type of squash – i think this will still be yummy if i replace the meat with some sort of plant based item… my sweeties is a veg head 😀 so my project will be to make things that we both like. it’s been a fun challenge so far actually! i have found a love for mushrooms and marinating them makes them ‘meaty’. i will probably add mushrooms to this recipe and some walnuts.. yeah that sounds yumm. might make it tonight since i’m hosting girls’ dinner at my place! my signature dish lately is my curried fish – i just get some good brand or fresh thai curry paste, saute it with with veggies and add a can of coconut milk. then i add chunks of whatever fish looks fresh! i used to do this with chicken but now i like the fish. i squeeze lime juice and sprinkle with cilantro or green onion, and huge hunks of avocado. this is also nice with roasted sweet potato slices… now i’m hungry, lol. i can’t wait to make my paleo pumpkin coconut pie this year, it was a huge hit last year. yay! I hate stuffing. I can’t remember a time ever in my life that I actually ate it. I’ve been trying to figure out something this year to make as a substitute. Love this recipe. I will be trying it! Great! I hope you do, it’s awesome! YUM! This looks freakin’ delicious. I’m attempting to add some healthier/paleo meals to my family’s usual carb-fest that we call Thanksgiving dinner. This sounds PERFECT. I’m definitely making this even if it isn’t for Thanksgiving. I don’t think my family has a mutual favorite dish for the holidays. Mine is definitely mashed potatoes, (on Thanksgiving and every other day,) my mom loves her homemade cranberry sauce, and the boys all care about the turkey. I don’t think any of us ever really gave the stuffing much attention. I’ve been eating the leftovers and it’s something you can eat anytime, not just for the holidays 🙂 Mashed potatoes were always a favorite too. The side dishes are just the best. It was so delicious, hope you try it! I could eat a meal of just this. Stuffing has always been my favorite thing. What you have here is uniquely different and exciting at the same time. Which isn’t an easy thing to do when it comes to food. It’s great! Hope you try it! This was so delicious!! It will be a fall and winter staple for sure. As long as I can find the butternut squash in stores. Thank you for this! Really happy to hear you liked it since it’s one of my favorite recipes! I’m new to Paleo after doing a couple rounds of Whole30. I was wondering what to do about stuffing in a turkey and then I found this. Oh, my word…this was delicious! I didn’t have the cranberries and used sweet Italian sausage links, diced small. My husband and I both loved it and I think it was even better the next day. Next time I’m thinking about adding some roasted walnuts or pecans. Thanks for sharing this! That’s great! This is one of my favorites. I also made a stuffing with pumpkin bread which is great, but, there’s something about the sausage and butternut combo that gets me every time! I just made this but I added brussel sprouts that I roasted with the squash and it was so good! 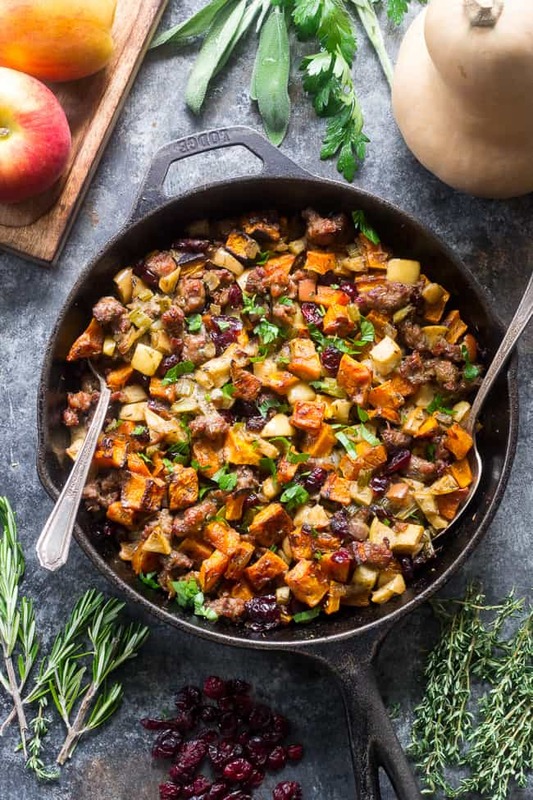 Thank you for the recipe I would have never have thought to mix sausage and butternut squash, so good! Hands down the best thing I have ever made. So flavorful. Thank you for the delicious recipe. Day ahead and then bake it on thanksgiving? 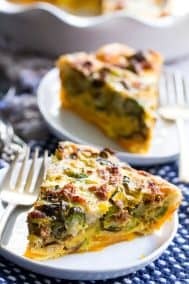 Could you make this with fresh cranberries instead of dried if I can’t find whole30 approved dried cranberries? Would it alter the taste too much if I left out sausage? 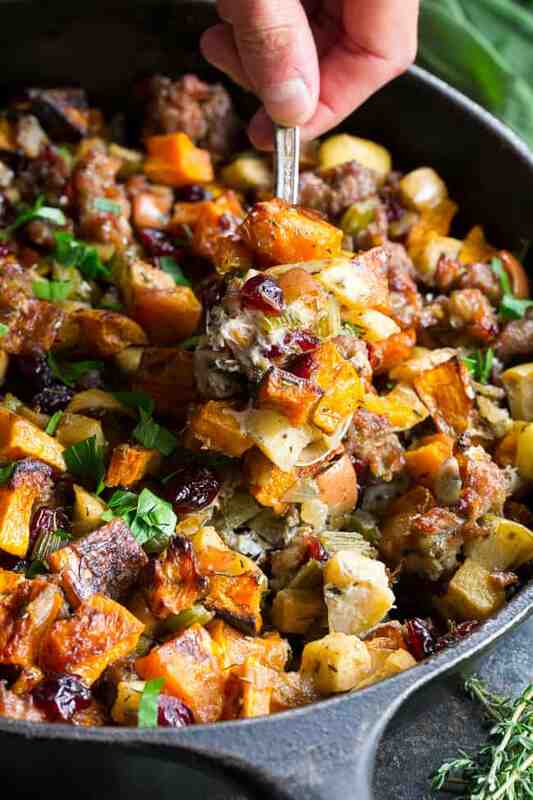 I’m looking for a vegetarian and grain free stuffing and this one looks and sounds delicious! You may want to add something else in – roasted Brussels sprouts and toasted pecans maybe? Amazing and addictive. Everyone’s favorite dish! This is my favorite too! I’m sad ours is gone now 🙂 So happy you guys liked it! Just wanted to say this recipe was PERFECT! Made it for Thanksgiving this year and my whole family loved it. My little boy is gluten/dairy/soy-free so I needed to find a stuffing that he could eat and just crossed my fingers that the rest of the family would like it. Well, they LOVED it and said it was better than our traditional stuffing, so thank you!! Total agreement. My friends and family go back for 3rd and 4th helpings. We use vegan sausage for kosher needs, and it’s just as fabulous. Enjoy!! How heavily does celery flavor come through? Or do you not really notice it? Celery is literally the only food I don’t like but I can handle it when it’s sauteed small in stuff with strong flavors and this looks amazing! Thanks! Can you recommend a substitute for pork? I was thinking sausage but I’m having a hard time finding compliant sausage. Thanks! Do you think you could make this the day before and then just do the final oven cook the day of? Or would the squash get mushy? I love this recipe! The flavor combination is incredible!! Definitely a must make dish!! Thanks for sharing. Seriously this is my favorite, I’m so thrilled you liked it! This sounds terrific and I’m taking it to my SIL’s house next week as an addition to her cornbread dressing. Can I double this straight up? Or any tips on doubling it? Made this tonight and it’s absolutely delicious! I didn’t miss the bread at all. Thank you for this amazing recipe. Made this for Friendsgiving tonight and it was SUCH a hit! I had zero leftovers to bring home. I was assigned to bring the dressing and gave no one a heads up that I’d be bringing a grain-free version but there were no complaints! Everyone loved it! Can I substitute the butternut squash for sweet potatoes? Made this for Thanksgiving yesterday, it was a hit! The only thing I would change when I make this again is to leave out the poultry seasoning and season to my taste. This is just a personal preference though as I don’t really care for poultry seasoning. Definitely reccomend this especially if you have any gluten sensitive family members! Let me start off by saying you are going to want to at least double or triple this recipe. It’s THAT good! Easily the best stuffing I have ever had. 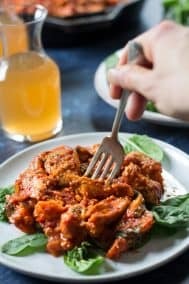 I brought it to my Non-Paleo family’s dinner, and it was the first thing to be devoured and received the most compliments! 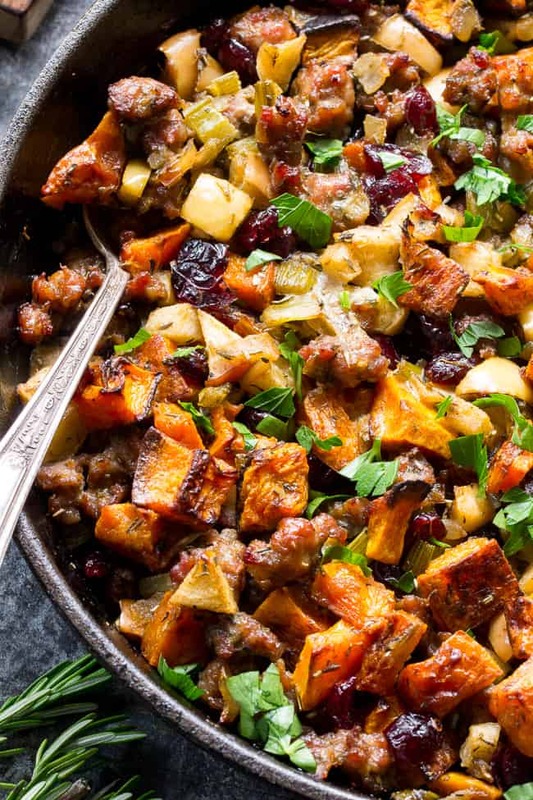 High praise when non-paleo people say they liked it more than regular stuffing! Absolutely fantastic recipe! So amazingly delicious! I doubled the recipe and still no leftovers. Will definitely add this to our Thanksgiving tradition. Thrilled you all enjoyed it! We made this at Thanksgiving, and it was *beyond*. I screwed up and didn’t get enough butternut squash, left out the egg intentionally, since it triggers migraines for my wife, and added some hot sausage to spice it up a bit. It was still our favorite part of Thanksgiving dinner. We’re making it again today, and can’t wait. As ususal, excellent! I ate some while it was hot and it was so good, I had some more when it was cold. I like it much better hot. I love stuffing and this is a way to get the taste of stuffing as often as you like and you’re still eating healthy! How cool is that?